A backlash is brewing over Ontario's move to a new harmonized sales tax and the Liberals are clearly spooked. The combined sales tax doesn't come into effect until next year, but already is proving to be such a bust with Ontarians that Premier Dalton McGuinty is giving ministers new marching orders to go out and aggressively sell it, the Star has learned. McGuinty is forcing his cabinet to go on a communications blitz to promote the move that will see Ontario blend its 8 per cent provincial sales tax with the 5 per cent federal goods and services tax. As of July 1, 2010, Ontarians will pay a blended tax of 13 per cent on hundreds of items that had previously been subject to only the 5 per cent GST. That move will boost the price of items such as gasoline, heating fuel, fast food, newspapers, magazines, taxi fares, dry cleaning and new homes costing more than $400,000, among other things. Fallout was evident last week as MPPs returned to Queen's Park following the Easter break. A week off in their ridings, listening to constituents' concerns about the revamped tax, left some Liberal members worried about their chances in the next election, in 2011. In debate on the budget in the House, Progressive Conservative MPP Peter Shurman (Thornhill) struck a nerve when he heckled Liberal MPPs who were trying to defend the blended tax. "You know you're getting the same calls we are," thundered Shurman, leaving some Liberal MPPs staring uncomfortably at their shoes. While Progressive Conservative and NDP MPPs can deflect angry constituents by opposing the tax reform, Liberal MPPs have been placed in the awkward position of being forced to defend higher prices for consumers. Against the nervousness in his caucus, McGuinty's office has ordered his cabinet to take action. After a closed-door meeting of communication advisers Friday, media staff spent the weekend adapting messages so each minister can discuss the merits of the new tax as it relates to his or her department in every speech and public appearance. "Here is stock language for your minister's speeches on our package of tax reforms," an internal email from McGuinty's office instructs ministry aides. "Please take a look at that language and resubmit to us the `top and bottom' that would tie the tax reform message with the efforts your ministry is making," the missive continues. Aides have until 4 p.m. today to submit their ministry-specific messages, which will then be vetted by the premier's office before being inserted in ministers' speeches. A deal to blend the taxes was secretly signed last month by the premier, Ontario Finance Minister Dwight Duncan, Prime Minister Stephen Harper and federal Finance Minister Jim Flaherty. It was done without the knowledge of other cabinet ministers. Many businesses like the streamlined levy because it will save in paperwork and reduce costs. McGuinty's new talking points for ministers insist "the tax reforms that will take effect July 1, 2010 are the single most important thing we can do to strengthen our economy." "We know that, for some items and for some people, it will mean price increases. That's why items like diapers, children's clothing, infant car seats and books are exempted," the premier's office message says. "To help with the transition to a single sales tax, families with an income of less than $160,000 will receive $1,000. Individuals, earning $80,000 or less, will receive $300. "And we're moving forward with permanent income tax cuts for Ontario families and businesses. In all, 93 per cent of Ontario taxpayers will get a permanent income tax cut." It remains to be seen how successful the campaign will be. Privately, some ministers and MPPs complain the new tax is a tough sell with recession-battered Ontarians – and they aren't even paying it yet. Publicly, Ontario ministers and backbenchers point out that the federal Conservative government is the Liberals' partner in the scheme, but in private some complain that they could pay a political price for Ottawa's initiative. They note that the $4.3 billion in federal funding that McGuinty received in exchange for harmonizing the taxes could be long forgotten by the October 2011 election. Ministers and MPPs report constituents are flooding their offices with angry letters and email. 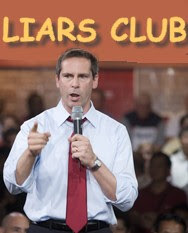 McGuinty get you're head out of you're a$$ and keep your hands out of my pocket full of lint!